We have always been overwhelmed by the tranquility and graceful nature of our homeland in the Trans-Himalayan region. We always wanted to share the world, the joyous moments one can have here. The result was JispaJourneys. Founded in 2005, JispaJourneuys’ humble journey started with adventure tent camping in Lahaul valley, becoming pioneers in the activity. JispaJourneys offers soft adventure tours which explores Western Himalayas natural beauty in areas where visitors normally would not venture. We make this possible with the knowledge and expertise of our special local staff. We offer you the opportunity to explore Himalayas totally in a different pace and perspective. To facilitate our clients and ensure better service to them we have our booking counter opened in Manali throughout the year for Hotel, Camping and transportation booking. 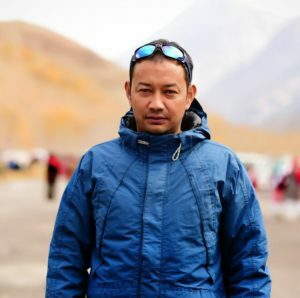 Founder and Managing Director of JispaJourneys, a native of Lahaul & Spiti, having spent the childhood in Ladakh from 1979 to 1993, has a considerable knowledge of the area and also well versed in the local languages. He completed his schooling from Tibetan S.O.S. Children’s Village, Choglamsar, Leh Ladakh and Dharamsala. He did his graduation from Delhi University. He has a good command in the languages Ladakhi, Tibetan, Hindi, English and working knowledge of Deutsch. Sherab has experience as a monastic and cultural guide (Delhi, Amritsar, Chandigarh,Dharamsala, Shimla, Kinnaur, Spiti, Lahaul, Ladakh and Zanskar) for many years. He is a avid traveller and a familiar smiley face in many motorcycle gatherings across the country.